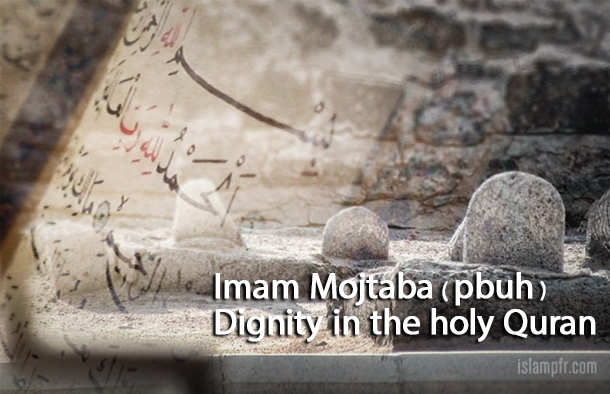 Imam Hassan Mojtaba (PBUH) is undoubtedly one of the Ahl al-Bayt and thus is free from any fault. According to Mubahala verse of the Holy Quran, he is considered as the son of Prophet Muhammad (PBUH). Mubahala event of Prophet Muhammad (PBUH) with Christians of Najran is recounted in Chapter 3 of the Holy Quran in verse 61. Hadith narrators have narrated in various ways that this Holy Verse was revealed concerning the dignity of Ahl al-Bayt (Peace Be upon Them) which include: Prophet Muhammad (PBUH), Ali ibn- Abi Talib, Fatima al-Zahra, Hassan and Hussein, and the word “sons”, in the verse, undoubtedly refers to Imam Hassan and Imam Hussein (Peace Be upon Them). Like the Mubahala verse of the Holy Quran, this story also implicates the high dignity, excellence and superiority of Ahl Al-Bayt and they are named as the most admired people to God and the prophet Muhammad. And other people will never reach their dignity, virtue and excellence. In the Holy Quran, God has never talked directly about impeccability of anybody except prophet Muhammad (PBUH) and his Ahl al-Bayt by stating that God has willed to remove any kind of impurity and uncleanliness from them. Although Muslims have different opinions about whether prophet’s wives are considered as members of Ahl al-Bayt or not, they all agree that Imam Ali, Fatima al-Zahra, Hassan and Hussein are the members of Ahl al-Bayt. Accordingly, we can perceive the hidden secret of favouring Ahl al-Bayt and being steadfast to their policy and as the Quran explicitly mentions it, we should prefer their love to others; because their impeccability is the best reason to know that following them in different situations will lead to our security and salvation when there are various opinions and different topics. The people whom God saved from impurity, guide other people through salvation and their followers will be saved from damnation. / going astray.